Here are a few ideas I have incorporated in the shop. No doubt these are not original, but maybe they can be useful to you. Ye 'ol cleco jug (with built in handle and holder for the pliers). Also notice the power screwdriver holster that is pretty handy for toting the rivet gun around as you move from one side of the jig to the other. This one is really neat; a dimpling table. 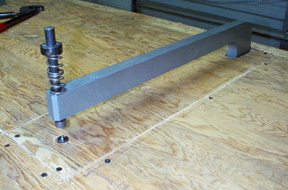 Notice the well that was constructed so the C-Frame could be recessed below table level. This leaves the dimple die at table level so you don't have to wrestle the skins so much (usually you will lose!). In actual use, a piece of carpet may be placed on the table (with a hole cut out for the die) to protect the skin. 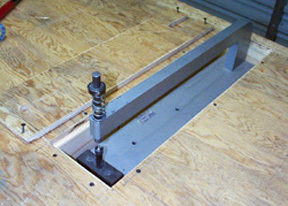 The C-frame can be shimmed up to compensate for the thickness of the carpet. Note: I find it easier to put the male die on the bottom and place the drilled hole over it since I am using the return spring. 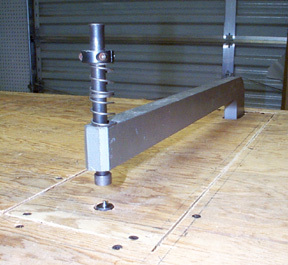 Inserting the rod-end bearings into the control surfaces requires a tool that will not damage the bearing race as it is forced against the friction of the plate-nuts. 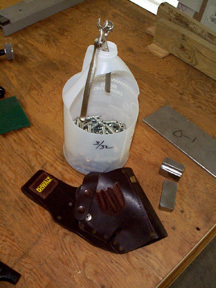 Several home-made and commercial tools are available. 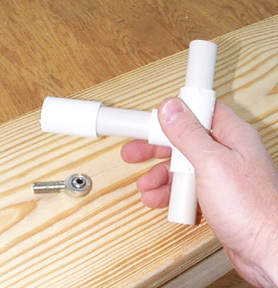 Here is a very inexpensive tool I built in just a few minutes. 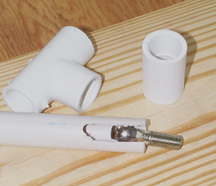 You need a few inches of 1/2" PVC pipe (the thick kind), a coupling, and a tee (use an el if that is what you have on hand). 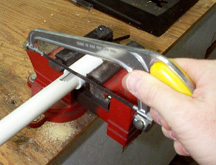 Cut a notch in the pipe as shown that is wide enough to accommodate the width of the bearing flange. 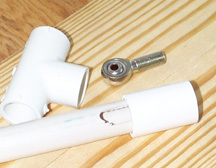 Glue the notched pipe into the coupling. 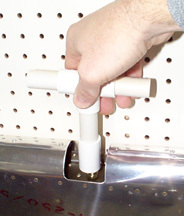 Cut the pipe flush with the coupling. 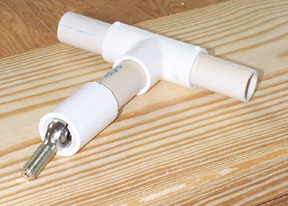 Cut three short pieces of pipe to serve as handles and glue the whole contraption together. You can see how the notched pipe grips the bearing.